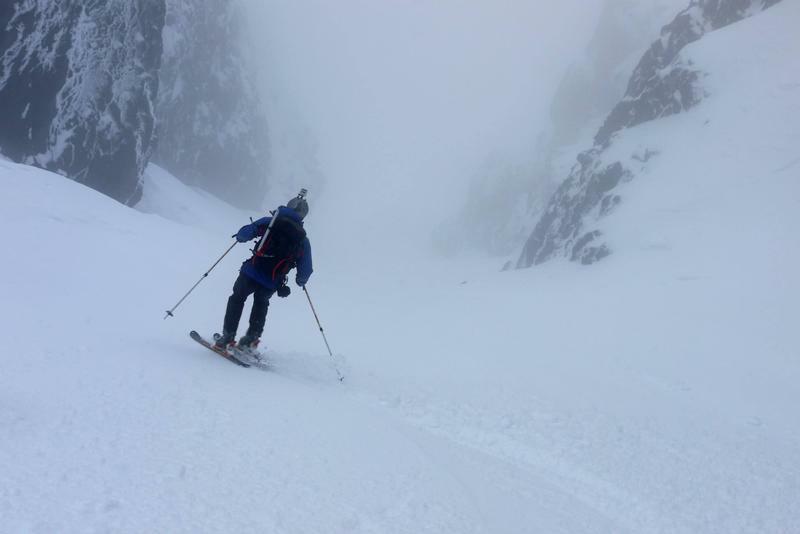 Coire Lagan may not feature highly on many people's list of ski destinations, but in the right conditions, there's potential for a bit of skiing here. Despite the proximity of the sea, good conditions do exist. In order to time a successful visit, you will need to keep a close eye on weather patterns, maybe get a little local knowledge, and have a bit of luck on your side. 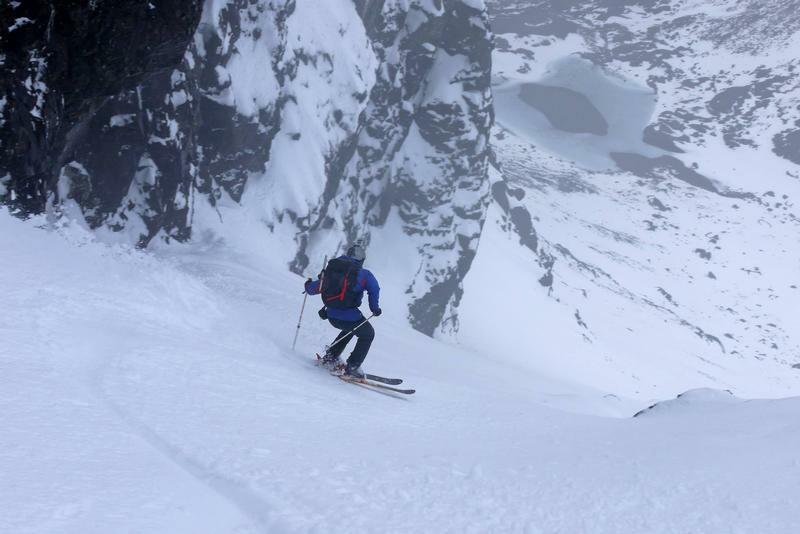 If things really are going your way, then you may not have to pick bits of gabbro out of your bases after a ski! 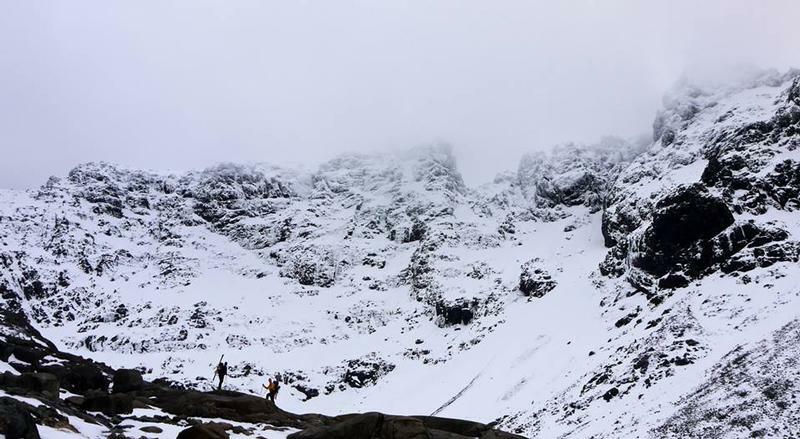 The best approach is to park at the Glen Brittle campsite gates, and follow the obvious path into Coire Lagan, keeping to the left of the slabs as you make your way over the lip to the lochan at 560m. It is best, and easiest, to do this, rather than climb up onto the ridge first. From the head of the lochan, The Great Stone Shoot is on the right hand side, with either a sizeable snow slope if you are in luck, or scree slope at the bottom of it if you are not. A descent from the summit of Sgurr Dearg. 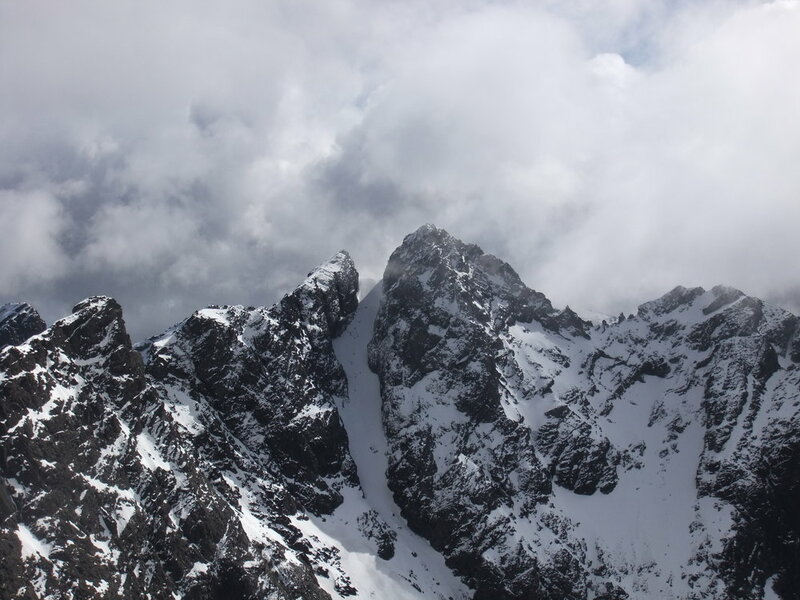 In February 2014, there was a complete line from the summit, taking the slab on the West side of the Inn Pinn, and down the gully that bounds the East side of South Buttress. It looked like a great line, but the snow lying on the slab of rock at the top would be of questionable stability. There is a corresponding gully line going lower into the corrie on the West side of South Buttress. Both of these lines have a Southerly aspect. When covered, the An Stac screes would be an enjoyable ski. The Sgumain Stone Shoot, which lies lower down and out of the upper corrie, would require a considerable amount of snowfall to cover the low lying boulders beneath it. The most obvious feature in the corrie from a skiing point of view, is The Great Stone Shoot. This wide corridor separates Sgurr Alasdair from Sgurr Thearlaich, and the spine of the main ridge. The top of the gully is a narrow col, and in winter, forms an arete which is unlikely to ever form much of a cornice. On a clear day, the views out to sea over Coire a' Ghrunnda are superb. Optimum conditions would allow a descent all the way to the lochan at 560m a.s.l., giving you over 400m of vertical. The gully gets its name for a reason - there are a lot of stones in it, and getting enough snow to cover them is critical. However, it happens more than people expect. 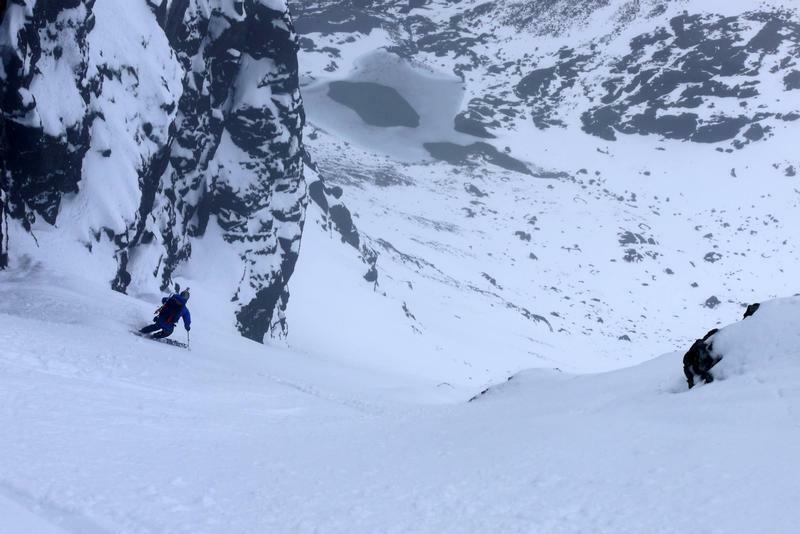 Getting enough snow cover all the way to the lochan is harder, and it is likely that timing your visit to coincide with this will be more taxing than the actual descent itself! It is easiest to ascend the gully first, rather than approaching along Sron na Ciche or from the main ridge. The slopes below the gully are at least as steep as the gully itself, and this is one of the easiest Grade I gullies you are likely to ski. It is in the most part at least 15m wide, and rarely exceeds 30 degrees. It's a fine outing, and comes highly recommended. Notes: Very easy for the grade. The approach slopes are as steep as the gully.